Misha is terrified of them, especially the ones that make a loud booming sound. The other night someone set one off. The sound and vibration were so forceful I jumped from my chair, car alarms went off all over the street, and Misha ran for cover. 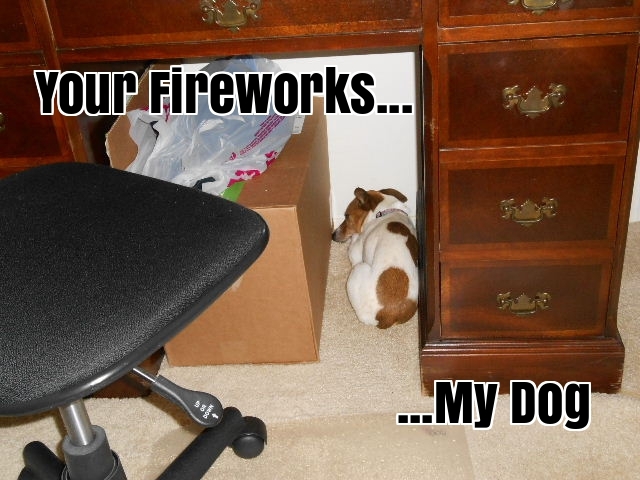 I already know that my not so brave Jack Russell Terrier will be in a panic with the fireworks begin. She got scared the other day when there was popcorn popping in the microwave! (It does sound a little like firecrackers if you think about it.) I will be taking steps to ensure that she doesn’t spend the night shaking in terror. I will take her on an extra long walk to burn off a little of her energy. In the early evening, I’ll give her a sedative. This will help calm her nerves when it gets noisy. I’ll sit with her if she needs me. Sometimes she feels better behind me on my office chair or pressed up against my side on the bed. I’ll be there for her. I’ll leave open all her hiding places. I do need to eat dinner and go to the bathroom every now and then. Her hiding spots will be waiting for her so she can feel safe when I’m out of the room. 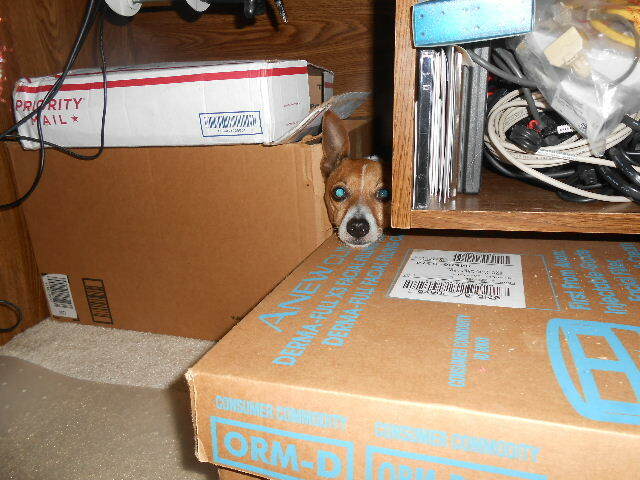 Here is one of her favorite hiding places. It’s blocked by a box to make a cubby hole. I’ve placed her large stuffed animal under there. When she gets scared, she has a buddy to sit with. 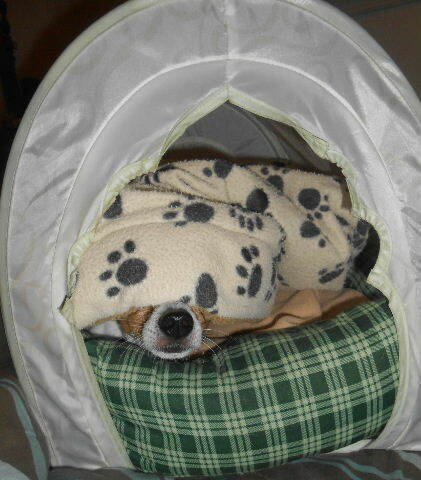 You would think that she would chose to go inside her tent and hide under her blankets, wouldn’t you? Not my dog! She tends to hide in the open like under a desk. Perhaps she feels the need to keep an eye on me while she goes for cover. Please remember that loud noises are scary for many animals. Take steps to keep your pet safe during the holidays. They may react in ways you aren’t used to. Provide them a safe hiding place. Put on some music if it will help to mask the sounds. And, don’t be afraid to ask your veterinarian for suggestion on how to make it easier for your dog to cope. There are sedatives, both natural and prescription, that can help ease the fear. Help them get through the evening so everyone can have an enjoyable celebration!